The Purple Martin is a bird that is primarily dependent upon the assistance of humans in the areas east of the Mississippi. They are our largest swallow measuring from aproximately 7 1/2 - 8 1/2 inches. 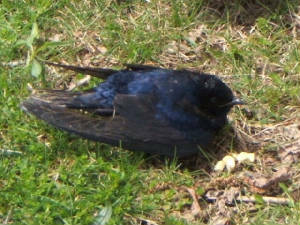 The male of the species is uniformly blue black with a forked swallow tail. The female is grayish underneath. Here in the Portage Lakes we provide gourds for their nests. We discovered early on that they prefer them to the usual Martin houses. We do use some native gourds, but we have purchased synthetic gourds that are more easily maintained. The Martins seem to be equally happy with both. The Purple Martins are a migratory species, flying to South America for the winter. They return to our area usually during the month of April. In August, their Premigratory Roost at Nimisila Reservoir is a spectacular sight, with some 5000 to 10,000 Martins stopping over to rest briefly before proceeding on their long journey. PLPMA has use of the State Park barn for the winter. It is heated and can be used for care and storage of the gourds during the colder months. Also, in checking at Y-Noah site, Larry Hunter discovered that there were at least two nests we didn't know about. These birds were not in our count, so we had more than we thought. First sighting was by Kay Lucak on Easter Sunday (April 1st). 2 were at Long Lake Beach Association and 3 at State Mill on Wednesday the 4th according to Larry Hunter who subsequently spied 5 Martins at the State Mill site in the morning of April 6th. JoAnn Pence was taking pictures and said they were there on April 5th. As of April 10th, our beloved Pres (Paul Toth) fed 17 birds at State Mill. (Volunteers to help with feedings???) Contact Paul. Looks like a record for this year? We had 215 nesting pairs, 1236 total eggs, 847 hatchlings and a grand total of 850 fledglings. We think they may have nodded their thanks as they flew by us when "staging" on Nimisila. 179 nesting pairs of ASY (after second year) birds laid a total of 825 eggs and fledged 728 Martins. WANT TO PROVIDE A HOME FOR THE MARTINS? This has been a great year for Purple Martins in our area. Everyone had more martins than ever before. Our friend, Paul Troyer of Riceland Ohio, had a fantastic year. He fledged 726 martins. As reported before, Paul has a banded bird at his colony that was born and banded at our Site #4 (Judy & Larry Hunter’s). This After Second Year (ASY) female nested last year at Paul’s and nested this year in the same cavity. Paul manufactures wooden martin houses. His design incorporates all the latest advances in that style housing. Anyone interested in this type house can contact Paul at Orrville Woodcraft - Tel.330-682-2958. Another source for Martin Housing is Andy Troyer, Birds of Paradise, Conneautville PA. - Tel.800-872-0103 or Purple Martin Conservation Association, Erie PA. - Tel. 814-833-7656. Our congratulations to Ted Carter who, after years of trying, finally had a nesting pair of martins. His babies hatched the first week of August, which is really late. It is such a great day when you become a Martin Landlord! 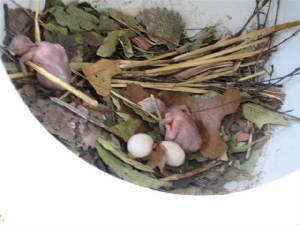 Larry reports that he banded 28 tree swallows and checked nests. He found 5 babies in the 1st nest, 6 in the 3rd, 5 in the 5th. 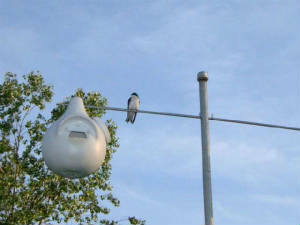 For the purple martins there are 108 nests with a total of 450 eggs. There are 12 gourds at Larry's house and all 12 have nests. Over 100 dozen eggs will be used to feed the Martins this year. The first egg was laid on May 7th.